I've read every single John Green book out there and Looking for Alaska is one of my favorite books of all time. However, I found myself being really disappointed by An Abundance of Katherines and Paper Towns, for some reason. It isn't until The Fault in Our Stars that I found my love for John Green again. 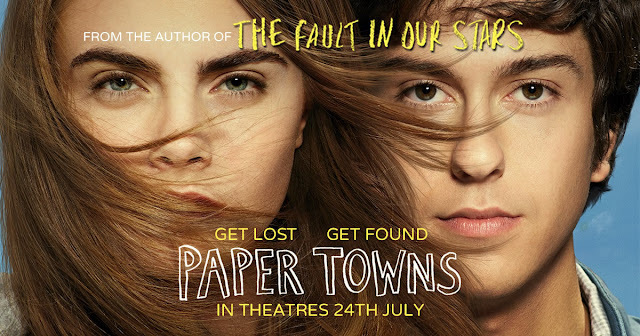 That's why I was so surprised to have fallen in love with Paper Towns: The Movie. What I didn't like about Paper Towns: The Book is that I couldn't relate with any of the characters. While the writing was witty and the story was fluid and the book was actually nice as a whole, I found that it lacked that oomph to make it an amazing read. And that's what the cast of Paper Towns: The Movie has done. It gave it the extra oomph that the book needed. Cara Delevingne is a revelation as Margo Roth Spiegelman, playing her in a way that feels incredibly natural, casual and cool. Seeing Cara on-screen, it wasn't hard to believe that people loved her. In the book, I couldn't really understand why Q liked her so much. In fact, Cara's Margo is so cool, she makes hoodies, Post-Its and jejetext look cool. And of course, my love Nate Wolff, is still as brilliant as ever, playing Q in the same effortless and believable way he has played in Stuck in Love and in The Fault in Our Stars in the past. Even the supporting cast is great and will make you feel like they are all good friends in real life. In fact, the cast is so good, you'll hardly notice the time pass by as you watch the movie and, by the end of it, you'll feel like they are all family. Like my favorite high school movie The Breakfast Club, Paper Towns proves that you don't need too much money to produce a classic film. Good music, good quotes and a good cast can go such a long way.